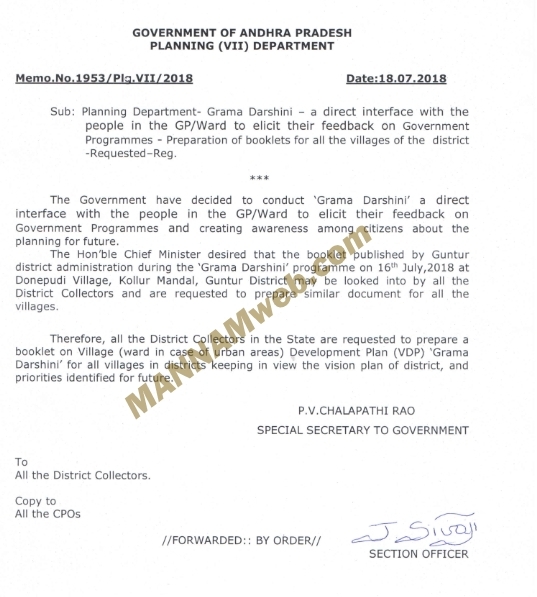 Sub: Planning Department- Grama Darshini - a direct interface gowith the people in the GP/Ward to elicit their feedback on Government Programmes - Preparation of booklets for all the villages of the district -Requested-Reg. The Government have decided to conduct 'Grama Darshini' a direct interface with the people in the GP/Ward to elicit their feedback on Government Programmes and creating awareness among citizens about the planning for future. district administration during the 'Grama Darshini' programme on 15th July,2018 at Donepudi Village, Kollur Manda!, Guntur District may be looked into by all the District Collectors and are requested to prepare similar document for all the villages. Therefore, all the District Collectors in the State are requested to prepare a booklet on Village (ward in case of urban areas) Development Plan (VDP) 'Grama Darshini' for all villages in districts keeping in view the vision plan of district, and priorities identified for future.